I have said it many times and I will say it again, "A mind is a terrible thing to lose." Jill asked to see a tutorial on piping a bishop bias band neckline. I had every intention of doing it before I left for Israel. Ran out of time. I am working on a bishop now that I planned to use to take photos. In looking through other photos on my computer for something else, I ran across photos I did LAST YEAR with the intention of doing just that. I tell you my mind is gone. Gone. Oh well. I love the look of a piped bishop neckline. I must admit that observing so many of Cheryl's is what gave me the bug. I just love the tailored, clean finish look of it. And to be honest it makes placing your bias neckline on a bishop a piece of cake. You can place that piping right where you want it without hoping it is lining up like you want it to. Often times putting on a bias binding can feel like a bit of a stab in the dark. Not so with adding piping first. No matter how wiggly my top row of stitching might be, I can get that piping right where I want it. The illusion of it makes you think my stitching is straight when in reality is isn't. Here goes, remember to click on the pictures to enlarge. 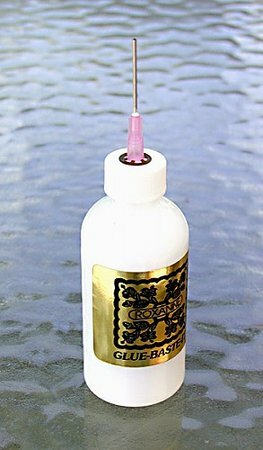 Roxanne Glue Baste, (It is great. It is available at most sewing and quilt shops. I will admit to using straight up Elmer's glue as well in the past.) I will glue down the piping all the way around the neckline. I can see right where I want the piping to be and once in place, I give it a quick press with the nose of the iron. It isn't going anywhere. If you want you can stitch it down now. The first few times I used this technique I did stitch it down. Since I am usually in a hurry, I just move on to the next step. I use a single layer bias binding. 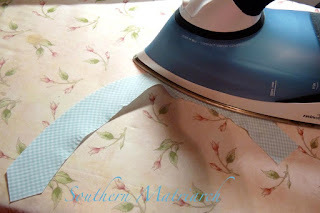 Press it into a gentle semi circle, this will help it go around the neckline without any ripples. Do not pull and stretch it as you press. Be kind to your bias binding. 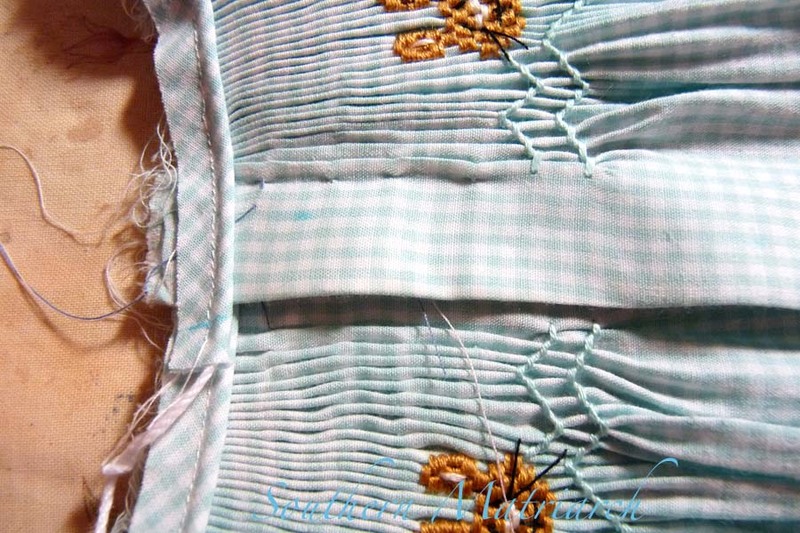 Before pinning the bias to the piped neck, check that your smocking depth matches at the placket. If it isn't, you can spritz the piping with a little water, the glue will loosen and you can adjust it's placement. At this point, I also will make a blue mark on the piping at the edge of the placket, pressing hard enough for the mark to go through the fabric to the piping cord inside. Now give just the cording a gentle tug until you reach the blue mark, snip off the excess, release the cord and allow it to go back into the piping "casing." This will make your piping seam allowance easier to turn to the back to later be covered by the bias band on the wrong side. Pin your bias band to the piped neck, again without pulling or tugging. Being kind to your bias will give you better results. The outer edge kicks up while pinning, ignore it. It is a physics thing as my son in law says. 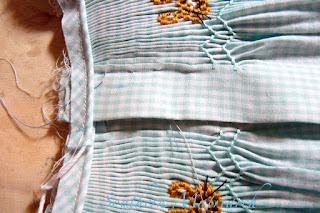 Stitch your bias on snugging that stitching right up to the piping. This is where I run the bamboo skewer along in front of my presser foot, making a valley in the fabric pressing down right next to the piping underneath. After that first run of stitching, flip your bias up and check to see if the seam is right next to the piping. I can't stand seeing the stitching used to make the piping peeking through. Adjust if necessary. I admit that if I miss, I don't take the stitching out, I just run another line of stitching closer to the piping where necessary. Now either move your needle position or your presser foot and run a second row of stitching 1/8-1/4 inch away from your first stitching. This is the same technique used in the collar tutorial. I then trim right up close to that last row of stitching. 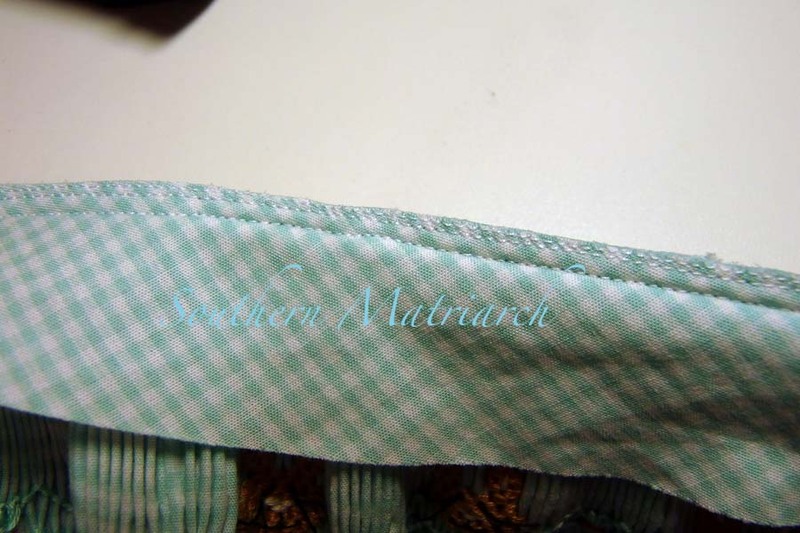 (In this picture I must have decided I wanted a wider bias band since there is a third row of stitching.) This trimmed edge is very important. It gives your bias something firm to fold over when you stitch the folded raw edge down on the inside. I did not take pictures of stitching the bias down, but Jeannie over at The Old Fashioned Baby shows this. When folding over the bias, fold it straight up and over, don't pull it to one side or the other. I stitch mine down starting in the center and working to either side. I find if I stitch from one placket edge to other, by the time I reach the other side, I have inadvertently pulled ripples into my bias binding. Voila, a tidy firm bias binding with piping. My favorite treatment for a bishop neckline. You can have fun with it; you can have a contrast piping that matches your stitching or adds an additional pop of color, or it can be more subtle and blends in with using a matching piping. What ever strikes you at the moment. Thank you! 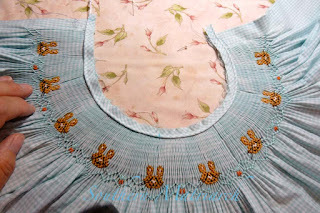 I have been reading your blog for a while and I ust cut out & pleated my first Bishops dress. I'm about to block & embroider. I have worried about how to make the neckline tidy so this was perfect! Thank you for adding this tutorial to your blog. I have a recently purchased pleater and have yet to smock anything. I am certain I will be back to see this tutorial in the future. Another excellent tutorial! One question-do you prefer to finish the neck before or after smocking? Or maybe it just depends on the design you are doing? Eileen, thank you. Sometimes it depends on mood and time. I have completely finished a bishop before doing any of the smocking which is great. 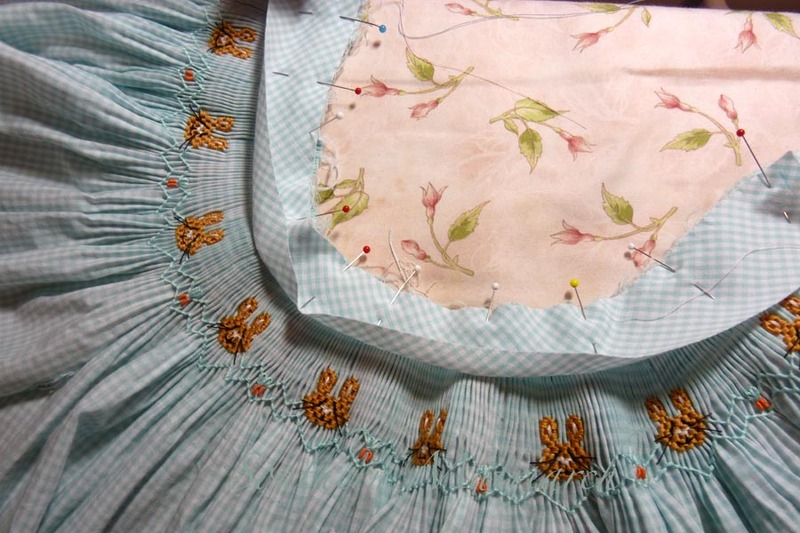 The one thing you have to be careful of is that you count the pleats first and count accurately. That sometimes is a problem for me. I can't count and end up with an odd number of pleats which will make your smocking design end differently on either side of the placket. Usually though it is dictated by time, I want to take the project with me somewhere and don't have time to finish the neckline first. 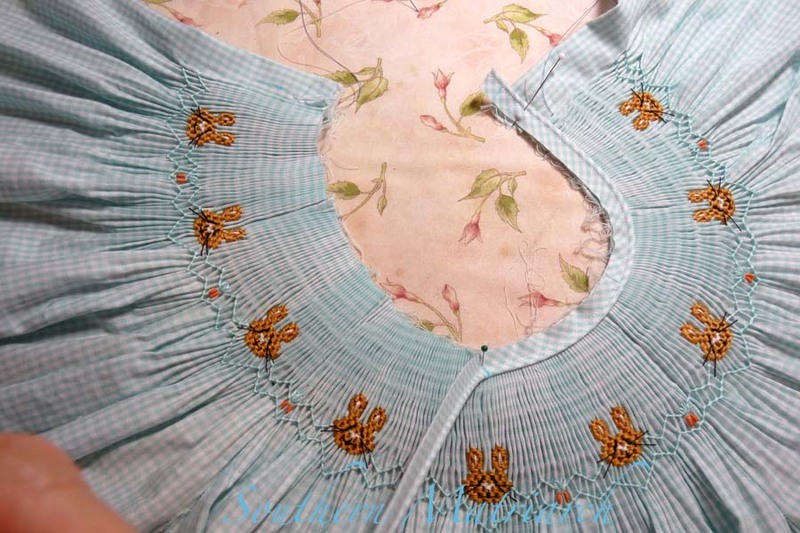 I am in the process of smocking my first bishop dress and I was wondering how the neckline would get finished. This tutorial is great. What a wonderful tutorial! I have always wanted to add some piping but have had difficulty. You make it look easy and I will try when I put my latest bishop together! Thanks! Excellent, Martha! I actually do mine a little differently, but will try your way...just need to get me some glue first. 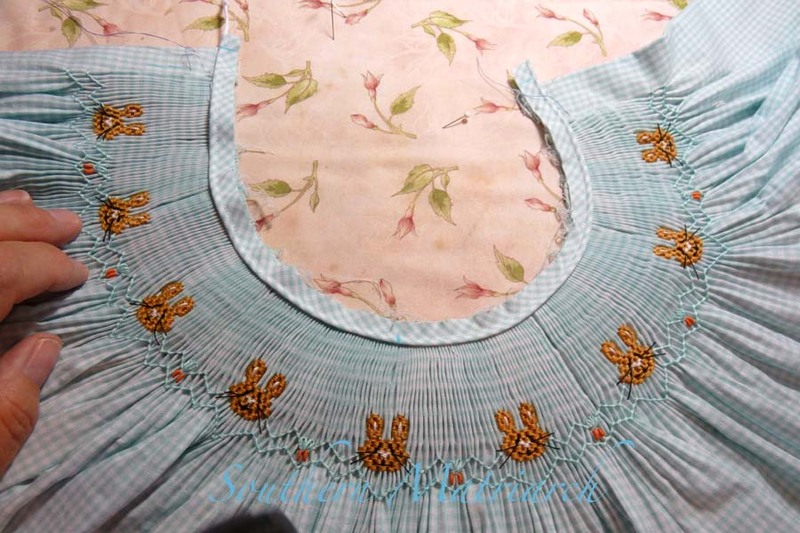 Also, when I smock a bishop I do the geometric smocking, apply and hand stitch the neckband, pull my pleater threads, and then do the embroidery or bullion roses. It's so hard to remove pleater threads if they get caught up in the bullion stitches. What a great tutorial for those who have wanted help. I'm thinking I need to stitch up another bishop. WOW, thank you for the fab tutorial! My granddaughter is due to arrive in October so I can't wait to get started on some gowns for her. 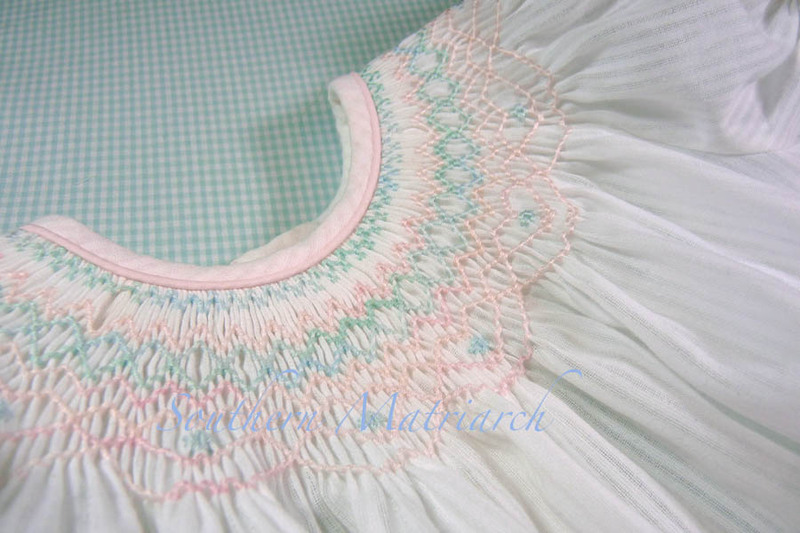 I haven't smocked since my daughter was young and I'm anxious to get back into it. I love your blog and have it bookmarked. Thank you for another terrific tutorial. You are so generous sharing your talents with others. 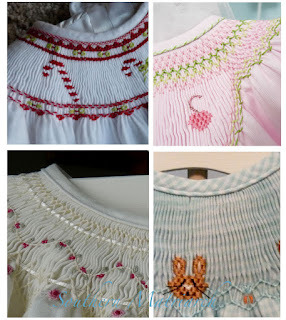 I follow your blog regularly & adore the beautiful clothes you make for your grandchildren. I like the single layer of binding, and love the piping! Thanks! Thanks for the input on finishing pre or post smocking. To be honest, that will probably be the deciding factor for me also! What a great tutorial. I went straight on line and ordered some glue! I was not sure if I would be able to get it here in the uk, but managed to find it. Eagerly anticipating its arrival to try it out. I just love, love, love, anything that makes life easier, and as pinning often distorts the piping, I can see that this is going to be a great success! Thankyou. Sure enough, I am back to see this tutorial! Kathy, glad the tutorial helped. As far as a bishop pattern, my favorite is Children's Corner.